ATLANTA—Fernbank Museum of Natural History opens a major new exhibition of incredible artifacts and profiles the 13th century journey of Marco Polo in Marco Polo: Man & Myth, on Saturday, September 28, 2013. The exhibition opening includes several activities as part of the Marco Polo Celebration Days, which will be offered from 10 a.m. to 2 p.m. on September 28 and October 12. In celebration of the exhibition, Fernbank Museum is offering two opportunities to enjoy a taste of the Silk Road through event days that feature sights, sounds and tastes inspired by the incredible cultures Marco Polo encountered on his 24-year journey between Italy and China. 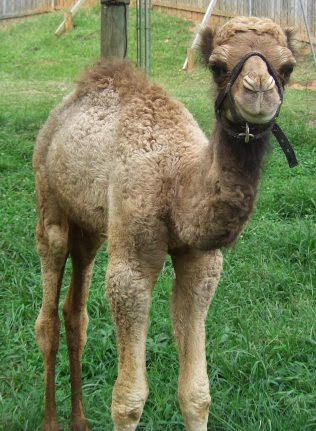 · See a live baby camel, reminiscent of the iconic sights from Marco Polo’s journey through the Middle East. · Sample tastes of Indian and Italian cuisine inspired by the exhibition and offered by some of Atlanta’s favorite international restaurants, including Bhojanic, CardamomHill and Saba. · Enjoy special Kung Fu and Lion Dance performances from Chien Hong School of Kung Fu of Atlanta in celebration of Marco Polo’s experiences in China. · Witness falconry demonstrations, a custom of the Mongol culture, with a falconer and live bird of prey from Medieval Times. · Participate in hands-on crafts for children, including opportunities to create a Chinese drum and an ancient medallion passport. · Follow along with the ultimate adventure traveler as you explore the exhibition using the new On the Road with Marco Polo mobile experience, which unlocks special content with unique codes found within the exhibition. More activities will be announced soon for the second Marco Polo Celebration Day, which will take place on Saturday, October 12. Marco Polo Celebration Days and Marco Polo: Man & Myth are included with museum admission and are free for members. Tickets are $17.50 for adults, $16.50 for students/seniors, $15.50 for children ages 3-12, free for children ages 2 and under, and free for members. The Marco Polo exhibition is on view from September 28, 2013-January 5, 2014. Fernbank Museum of Natural History is located at 767 Clifton Road NE in Atlanta. For tickets and visitor information, call 404.929.6300 or visit fernbankmuseum.org. Keep in touch with Fernbank on Facebook (facebook.com/fernbankmuseum) and Twitter (@fernbankmuseum). Marco Polo: Man & Myth is organized by Contemporanea Progetti & Expona. The exhibition is sponsored locally in part by The Rich Foundation, Inc.